Original Oil Painting on Canvas Gallery Wrapped. 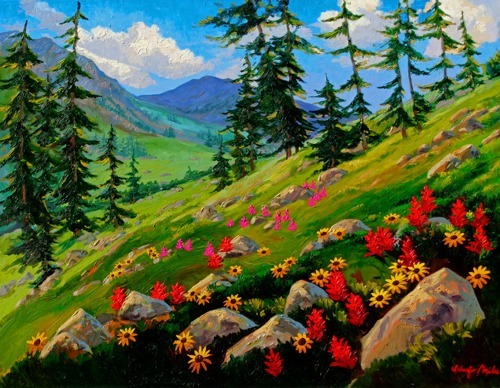 The hike at Booth Falls just east of Vail Colorado offers amazing views of a valley filled with wildflowers that inspired this painting. On a beautiful summy day your soul soars to greater heights. Rest and rejuvenate as you immerse yourself in this peaceful world. Let your heart love the solitude and contemplate with wonder and contentment the natural glory God has shared with us. Original oil available, contact us for pricing. Painting is Gallery wrap with art painted sides. Framing is also available. Purchase an open edition mini print below - print on demand. Framing available. 5" x 6.5"9" x 11.5"13" x 16.75"